Completionism is a a crazy impulse. There are hundreds of Avengers issues unrepresented by oversized volumes, but omnibus collectors are super-focused on getting the relatively unheralded back third of Avengers West Coast into an oversize volume to complete their bookshelves. The funny thing is, I’m not sure all of the voters realize just how strong and cohesive this Roy & Dann Thomas run on Avengers really is. The Avengers West Coast by Thomas and Thomas Omnibus is the #40 Most-Wanted Marvel Omnibus of 2017 on Tigereyes’s Secret Ballot. Visit the Marvel Masterworks Message Board to view the original posting of results by Tigereyes and head to the Guide to Avengers West Coast to see how you can read this run right now. Past Ranking: This volume leaps up five spots from #45 in the 2016 survey. That’s 43 issues, which means the book could also include the full Bloodties crossover: Avengers West Coast (1989) #101, The Avengers (1963) #368-369, Uncanny X-Men (1963) #307, & X-Men (1991) #26. However, that would leave behind 20 issues of five related miniseries – U.S. Agent #1-4 (after #95 & Annual 8), Avengers: The Terminatrix Objective #1-4 (after #97), Spider-Woman #1-4 (after #101), Scarlet Witch #1-4 (after #101), and Hawkeye #1-4 (after #102). What to do? More on how to reconcile that, below. Creators: Written by Roy Thomas and Dann Thomas with pencils by Paul Ryan and Dave Ross with Tom Morgan, George Freeman, Herb Trimpe, and Andrew Currie. Can you read it right now? Mostly. Issue #76-79 and #83-88 remain uncollected (as is the U.S. Agent mini-series), but everything else has been captured. Visit Guide to Avengers West Coast for the full details. Unfortunately, most of this run is not on Marvel Unlimited. 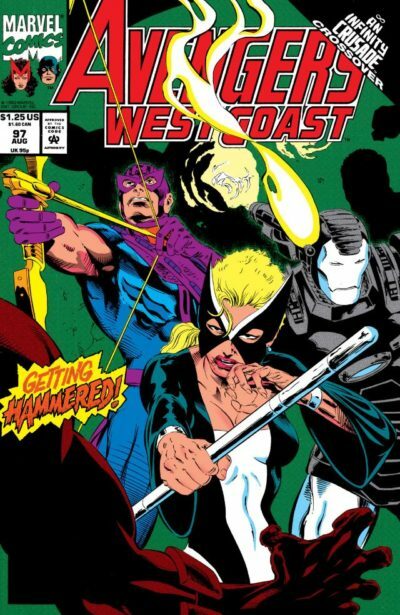 Avengers West Coast had gone for years as a forgotten era of Avengers as far as reprints were concerned until Marvel’s Cinematic Universe began focusing strongly on its core cast of Iron Man and Hawkeye, and later Scarlet Witch and Vision. 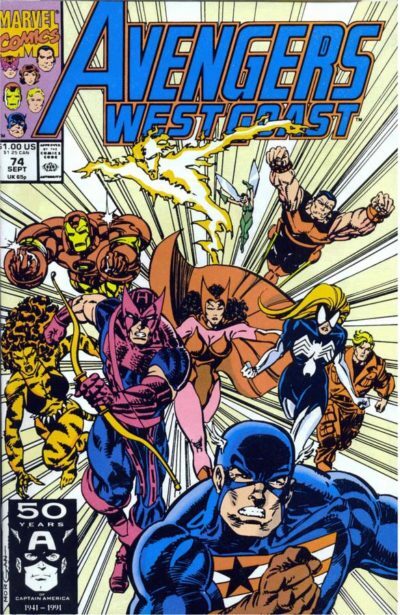 Suddenly, West Coast reprints were abounding – a set of Marvel Premier Classic hardcovers, corresponding paperback reprints, two omnibuses, half of an Avengers by John Byrne volume, and a handful of trades covering the latter run of the series. The only remaining gaps are #76-79 and #83-88, two stories split by the massive “Galactic Storm” crossover.